In the euro area, the area-wide fiscal consolidation (measured as an improvement in the underlying primary budget balance) of just over 4% of GDP between 2009 and 2013 was similar to that in the United States over the same period. This casts doubts about the role of fiscal tightening in explaining the comparatively weak performance of the euro area. The OECD is of course completely right. The fiscal tightening in the US and the in euro zone have been more or less of the same magnitude over the last four years. So don’t blame ‘austerity’ for the euro zone’s lackluster performance. The real difference between the euro zone and the US is of course monetary. The central bank can always offset the impact of fiscal tightening on aggregate demand. The fed has shown that, while the ECB has failed to do so. Rather the ECB continues to keep monetary conditions insanely tight. Aggregate demand is weak in the euro zone because the ECB wants it to be weak. The ECB has failed. It is as simple as that and the OECD understands that. The developments in the Japanese financial markets over the past week has caused a lot of debate about the sustainability of the “Kuroda shock”. It is particularly the rise in nominal bond yields, which seems to have shaken some Japanese policy makers. Even though the rise in nominal bond yields is a completely expected (for Market Monetarists) and welcomed (!) result of monetary easing it has nonetheless caused some to suggest that Kuroda’s monetary regime change is self-defeating. As I have explained earlier the increase in bond yields in itself is not a threat to the recovery, but I must also admit that some Japanese policy makers (and a lot of commentators) have a hard time understanding this. It might therefore be warranted that Bank of Japan chief Kuroda puts the record straight. “The increase in Japanese nominal government bond yields is welcomed news as it reflects investors’ expectations for higher nominal spending growth. Furthermore, I am very happy to see that real bond yields continue to decline as markets are pricing in that we are increasingly likely to hit our 2% inflation target. However, I am not satisfied with the speed of adjustment of market expectations to our inflation target. When we say we have a 2% inflation target investors should listen. So while inflation expectations have increased they are still far below our 2% inflation target on all relevant time horizons. We therefore stand ready if necessary to further step up the monthly increase in the money base. We will evaluate that need based on market expectations of future inflation. Mr. Kuroda, the advise is for free. Please take it. A key critique of monetary easing in Japan is that Japan’s real problem is not monetary, but rather a supply side problem. I strongly agree that the Japanese economy is facing serious structural challenges – particularly an old-age population and a declining labour force. However, I also think that there often is a tendency for commentators to overstate these problems compared to supply side problems in other developed economies. In this post I will therefore try to compare Japan’s structural problems with the structural problems of the other G7 economies – the US, UK, Canada, Germany, France and Italy. The conservative US think tank Heritage Foundation every year produces an Economic Freedom Index. Even though one certainly can discuss the methods used to calculate this index I overall believe that the Index gives a pretty good description of the level of economic liberalization in difference countries. And yes, I do equate the level of economic liberalization with less structural problems. 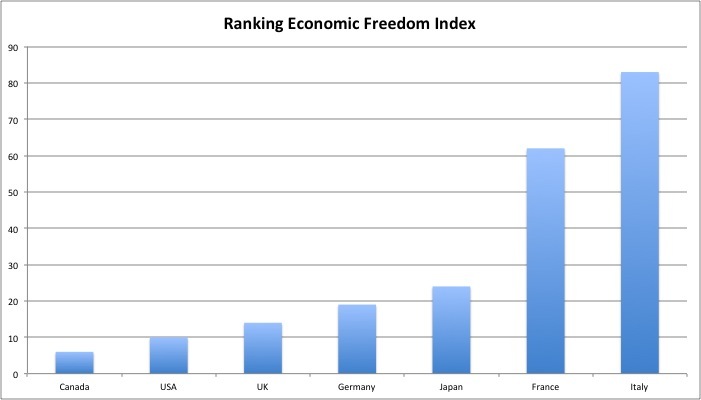 The graph below shows the ranking of the G7 countries in the 2013 Index of Economic Freedom. The picture is pretty clear. The Anglo-Saxon countries Canada (6), USA (10) and the UK (14) are significantly more economically free than particularly the interventionist South European countries France (62) and Italy (83). Japan (24) shares the “median” position with the other large exporter in the group – Germany (19). So while there certainly is scope for reforms in Japan it is hard to argue that Japan in general is a lot more interventionist than the other large economies of the world. In fact it is also hard to argue that Japan has performed worse than the other G7 countries over the past decade. As the graph below shows Japanese GDP/capita has grown more or less in line with the other G7 countries since 2001-3. The real underperformer is Italy rather than Japan, which should not be surprising given Italy’s interventionist policies and excessive regulation. But lets have a closer look at the data and see what Japan’s structural problems really are. 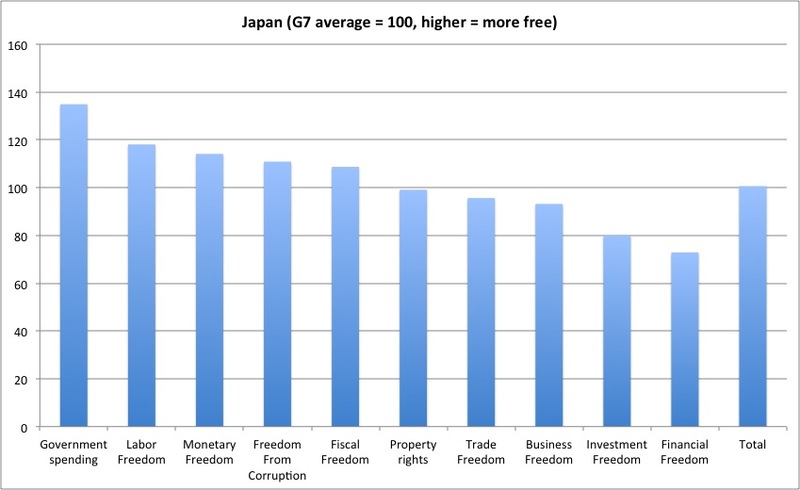 The graph below shows Japan’s relative ranking among the G7 economies in each of the subcategories of Index of Economic Freedom. I have indexed the average G7 ranking for each category at 100. The higher a score the more “free”. Again the story is the same – Japan falls smack in the middle among the G7 countries when it comes to economic freedom – with an average for all the categories score of 101. The breakdown of the numbers reveals both Japan’s relative strengths and weaknesses. For example the Japanese public sector is relative small compared to the average of the other G7 countries and the Japan’s labour market is relatively free. However, it is also clear that there are some clear regulatory weaknesses. This is particularly the case in the areas of trade, business, investment and financial freedom. The three first of them all really is about an overly protectionist Japanese economy – both when it comes to foreign and domestic investors and I think it is pretty obvious that this is where the reform effort in Japan should be focused. I really think it is straight forward. If Prime Minister Abe seriously wants to reform his country’s economy he needs to open it up to competition – both domestic and foreign. In the domestic economy I would like other commentators highlight the lack of competition in the retail sector where for example the “Large Scale Retail Location Law” tend to give artificial protection to small retail outlets (mom-and-pop shops) rather than bigger and more efficient retail shops such as hypermarkets. Similarly zoning laws are hindering competition in the retail sector while at the same time is deepening the decade long Japanese property market crisis. This is hardly an efficient use of economic resources. The need for retail, housing and agricultural reforms therefor for seem to be very clear and this is where the focus should be for Mr. Abe when he fires off what he has called his “Third arrow” – structural reform. Bank of Japan’s efforts to ease monetary policy has been criticized for being a beggar-they-neighbour policy. I think is a completely misplaced critique, however, it is indisputable that the outside world increasingly think of Japan as protectionist. I believe that a good way to calm these fears would be for the Japanese government to unilaterally remove all trade barriers and trade tariffs as well as opening up the Japanese economy to foreign investments. That would be in the best interest of the Japanese economy and would significantly boost Japanese productivity, while at the same making it very hard to the outside world to argue that Japan is protectionist. Even though there is an urgent need for economic reforms in Japan I fundamentally don’t think that the need for economic reforms is bigger than in France or Italy or even in Germany and I therefore think that the focus on monetary reform has been correct. Furthermore, as the new monetary policy regime is likely to pull Japan out of deflation and boost economic growth (in the next 2-3 years) the Abe government is likely to get more support for implementing less popular reforms. 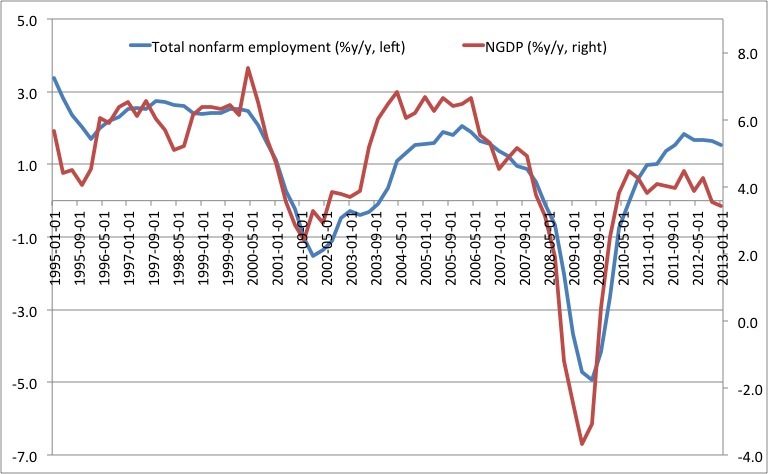 Furthermore, as the new monetary policy regime is very likely to increase nominal GDP growth both public finance and banking problems are likely to be reduced, which in itself is likely to support real GDP growth over the longer run. Concluding, the Abe government has gotten it more or less right on monetary regime (even though I would have preferred NGDP targeting to inflation targeting) and it is now time for Prime Minister Abe to prepare for his Third Arrow. Venezuelans have been hit by a chronic toilet paper shortage, leading to empty supermarket shelves and long queues to snap up the remaining rolls…When new stocks arrive at supermarkets customers have been rushing in to fill their trollies. It started with a food shortage and now it is the lack of toilet paper that is the latest economic problem in Venezuela. It is pretty clear that Venezuela’s chronic shortages of essential goods are a result of the combination of excessively easy monetary policy and price controls. If monetary policy is excessive easy you obviously get high and rising inflation. There is only on way of stopping excessive inflation and that is by slowing the money printing press. Instead the Venezuelan government continues to fight inflation with draconian price controls. He said monthly consumption of toilet paper was normally 125 million rolls, but current demand “leads us to think that 40 million more are required”. Anybody who have studied economics for 3 minutes of course knows that Fleming’s explanation of the toilet paper shortage is outrageously wrong, but I guess that the Minister himself is unlikely to have problems getting toilet paper supplies himself as the Venezuelan government is massively corrupted and Ministers certainly do not seem to suffer from the social ills that average Venezuelan have to struggle with. I have earlier argued that at the core of Venezuela’s economic policies is the fact that the central bank basically has been ordered to finance excessive public spending by letting the printing presses run overtime. There is only one way of stopping the inflation pressures and that is by stopping this monetary funding of public expenditures and then to implement radical monetary reform. Maybe the toilet paper shortage could convince the new Venezuelan president Maduro to end the Hugo Chavez’s fail policies and implement radical fiscal and monetary reforms – otherwise Venezuela might turn into the smelliest country in the world. PS This is my blog post #600.